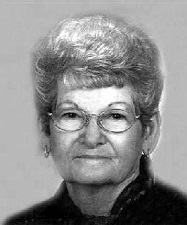 Jeanie Bell Salyers, 87, departed this life into the welcoming arms of her Savior on Monday, July 27, 2015 in Abilene, Texas. Jeanie was the daughter of Reba (Rosson) and Angus Wyman Shores, born on February 8, 1928 in the Iberis Community in Taylor County, Texas. For many years she was a beautician in the Abilene area. Jeanie was a member of Calvary Baptist Church where she was well-known for her pecan pies. She loved to travel, do puzzles and play games, but most of all she loved to be with her family. She married Elton Lee “Bud” Salyers on May 25, 1946 in Buffalo Gap, Texas. He preceded Jeanie in death on May 28, 2009. Jeanie is survived by her sister, Hortense “Shorty” Coats of Novice, Texas, and two sons, Ronny Salyers and wife June of Abilene, and Doug Salyers and wife Debe of Midland. Survivors also include four grandsons and spouses, Randy and Jeniffer Salyers and Cody and Ashley Salyers of Abilene, and Philip Salyers and Daniel Salyers of Midland; and seven great-grandchildren, Anicia Salyers, Rylan Salyers, Hudson Salyers and Kenlee Salyers of Abilene, and Adrien “Bucky” Salyers, Daniel Salyers and Matthew Salyers of Midland. Visitation will be 5 to 7 p.m. Wednesday, July 29, at The Hamil Family Funeral Home, 6449 Buffalo Gap Road in Abilene. Funeral services will held at 10:00 a.m. Thursday, July 30, at Calvary Baptist Church officiated by Rev. Mike Reed and Rev. Rodney Watson. Burial will follow in Elmwood Memorial Park. Serving as pallbearers will be Randy Salyers, Cody Salyers, Philip Salyers, Daniel Salyers, Charles Coats, Deral Coats and Calan Wills. Honorary pallbearers will be Claude Burton, Bill Mikkelsen and John Stanley. The family expresses special thanks to Hendrick Hospice Care and Mesa Springs for the wonderful care given our mother, Jeanie. Memorials may be made to Hendrick Hospice Care, 1682 Hickory Street, Abilene, TX 79601.